I’d like to say “Good on Ya,” to Aussie Author, D.A. 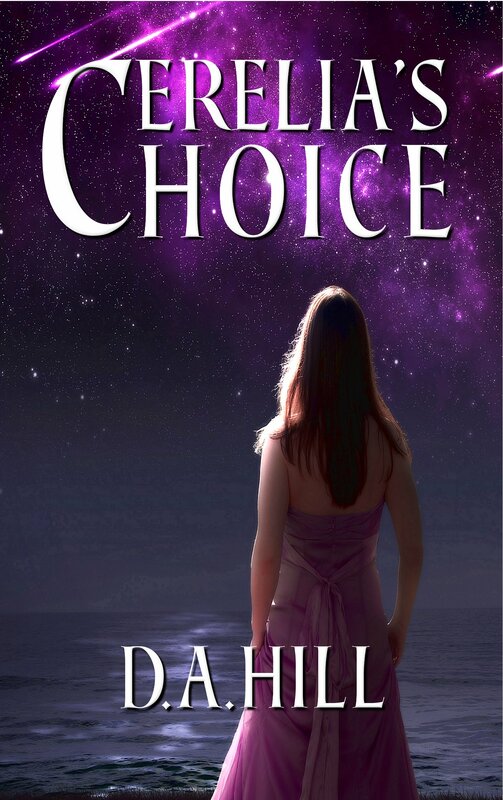 Hill for writing another book that despite being outside of my normal realm of reading genres, I read his publication Cerelia’s Choice engrossed from beginning to end. And I really enjoyed it too, I might add! The turns in the plot came often enough to keep me moving forward wondering what was going to happen next. You’d almost have to expect a story about a space pirate from a person who works in the I.T. field. But what remained consistant from his previous publications, is the author’s ability to express very realistic human emotion and dialogue through the character of the lovely Crown Princess and others. Earthly sentiments expressed in an “other world environment” resulted in a fulfilling read. This blog is brought to you by award-winning author Sue Batton Leonard. See you tomorrow on All Things Fulfilling! Since it’s a New Year, we have been focused on new experiences this week on All Things Fulfilling. It has been said that there has been a movement away from amassing lots of material things, and replacing them with investing in unique life experiences. Experiential travel, which is said to bring increased happiness, has grown in recent years. Perhaps living life differently, we don’t end up in our later years having big inventories of “things” to get rid of, instead our memory bank will be overflowing. Graham Hill speaks about living life edited in his TED talk. Take five minutes to listen to it! I may not ever have the where-with-all make it to the moon in my lifetime to experience weightlessness in space, but I can now say that I have experienced it in a more contained environment here on Earth in a float pod. It’s terrific! To learn more about this adventure, read the previous two blogs – Practice the Pause and From Lightweight to Weightlessness. Will you remove any “thing” from your “bucket list” and replace it with a real life experience in 2016? If so, what is it? We would love to hear from you. Post your comment right here on All Things Fulfilling. Gift of a Lifetime: Finding Fulfilling Things in the Unexpected and short stories Lessons of Heart & Soul. Will we see each other right here tomorrow on All Things Fulfilling? The last of a three part blog about author/playright Jorge Avila will be featured on All Things Fulfilling today. Before Christmas I interviewed Avila about his newfound sucess as a playright. To read the beginning of the interview, please go to from Local Author to Playright and Advancing the Story. Sue: So what does it feel like now that you have stepped away from all the excitement of seeing your musical played out on stage? Jorge: There is a little bit of sadness and a let down because it is easy to get carried away with all that goes with on in the world of L.A. But we aren’t done yet. My vision for this musical is even more than that. I have been offered a huge opportunity at the end of September and the first two weeks in October. The production will return to California as part of at the Hispanic Heritage Festival. For four weeks, in four different districts, I am told that 3,000,000 to 4,000,000 people will attend the festival annually. Do you believe that? Sue: And I understand you received special recognition during the three day run of the musical. What night was that? 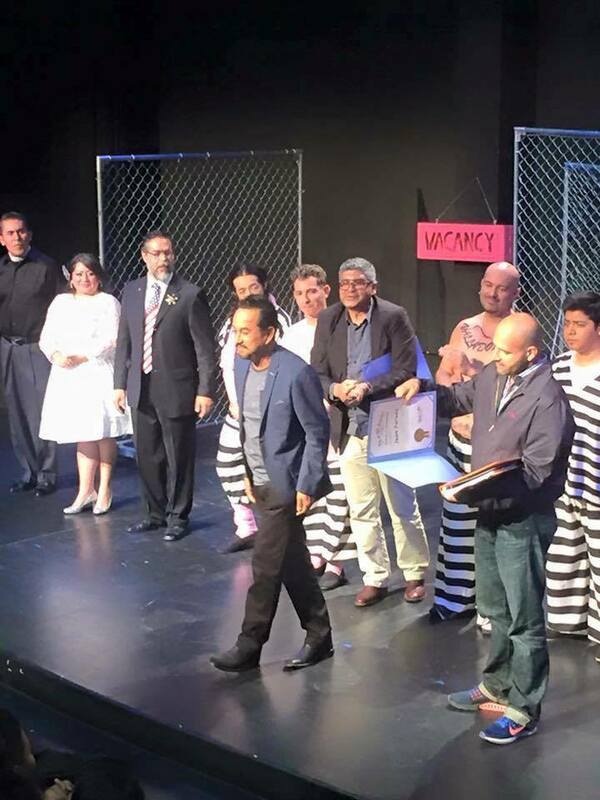 Jorge: On the middle night of the performance, I and the director and musical composer, Caleb Encampos, were each given certificates of award from the City of Los Angeles for work in advancing the arts. It was very exciting. Sue: What can you attribute to the success that you have had with Maricopa Men in Pink? Jorge: It was a long five years but I never stopped believing that I had a quality product and it was a matter of getting it into the right venue or environment. Sue: What’s on the docket for the future? Jorge: I have two more musicals I am working on and a book but, I would like to do something more with the local high school here in Steamboat. They did a Powerpoint presentation about my book’s storyline with the English as a Second Language (ESL) students. I’d like to put together some sort of workshop. We will see, I’ll have to put more thought into that. And I’d like to take the musical to Chicago. That’s where I’d really like to see it. Sue: You have been in a whirlwind for six months or more. Perhaps with a little time off, your visions will become more clear. Now that you have stepped away into a quieter environment, here in Steamboat, you can ponder it. Before Jorge and I said our goodbyes I told him how he is a shining example for other independent publishers to press on and not to give up. Although he mentioned feeling a little let down now that things were over, I saw a huge afterglow of success on his face and in his exuberant voice. 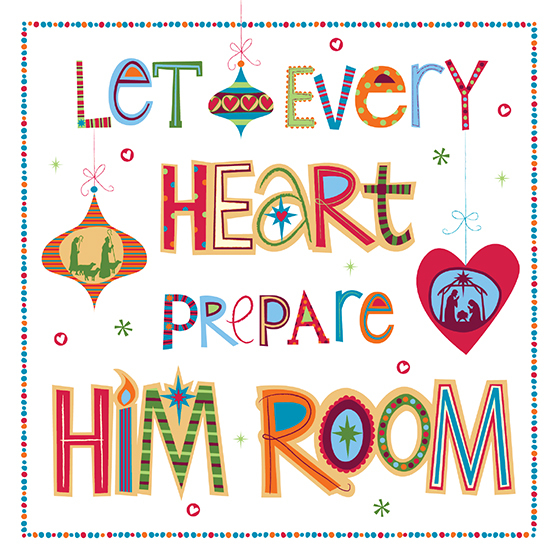 Do return to All Things Fulfilling tomorrow when we begin the countdown till the New Year! 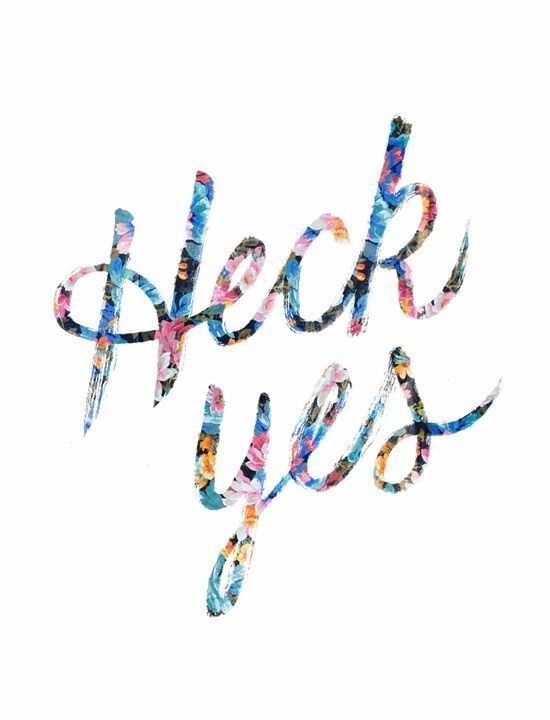 We will be fulfilling 2016 with new possibilities and opportunity! When our son was young, a few weeks before Christmas our neighbors, The Millers, arrived with a gift of a Christmas book or two from the infamous Northshire Bookstore in Manchester Center, Vermont. It was so very appreciated, and it was evident that a great deal of thought was put into the selection annually. It is impossible to say which book was a favorite because they were all so wonderful and some were pop-ups! The books were a gift to me too because it meant that I took time out of Christmas preparations and we spent extra time reading together. The Legend of Befana was a book that I especially related to as a woman because Belfana spent much time readying for Christmas by sweeping and sweeping and cleaning. Here is more insight into Befana, a character in Tomie de Paola’s beloved Christmas tale. 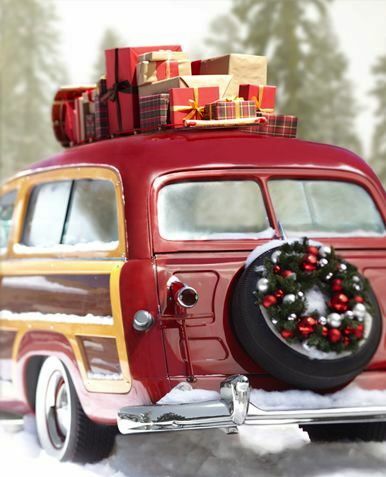 Wishing all of our readers a Very Merry Christmas! All Things Fulfilling will resume sometime between December 28th and the New Year. This blog is brought to you by the award-winning author of Gift of a Lifetime: Finding Fulfilling Things in the Unexpected and Lessons of Heart & Soul. Jorge Avila, a Mexican by birth, moved to the United States in 1995. Since then he has become an author of two books Suriana and the Sulphur Cave and Maricopa Men in Pink. 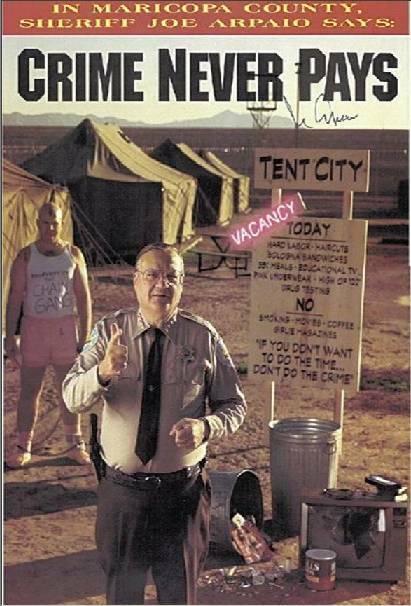 The later is a controversial story about prisoners in Arizona and “Sheriff Joe” known in the media as “the toughest sheriff” around. He sentenced two thousand convicts to serve their sentences in pink underwear and handcuffs for better accountability. The macho men probably could not have been more insulted! Christmas came early to Avila, a member of We Write Steamboat our independent publishing network group, when his first publication Maricopa Men in Pink was adapted as a musical and came to live theatre in Los Angeles. It had an extremely successful run with nearly booked houses each evening. Stay tuned to All Things Fulfilling on Monday because we will be featuring an interview with him about what it has been like to go from local writer to a playwright within a very short few years. 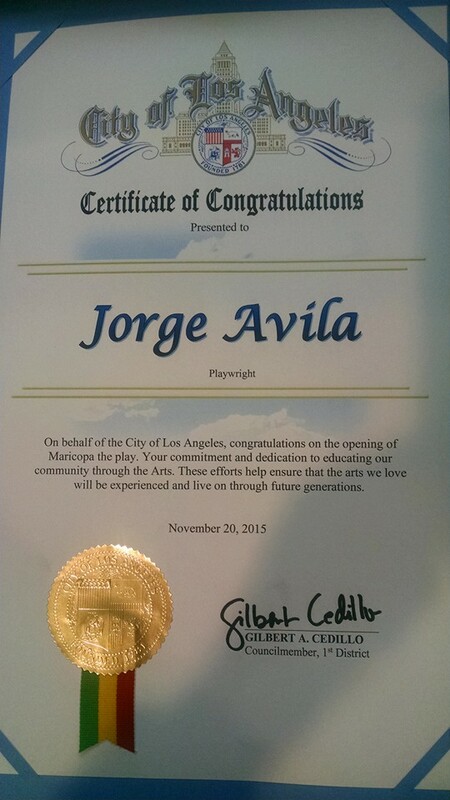 Avila was recently recognized as a person who has helped advance the arts in the LA area. 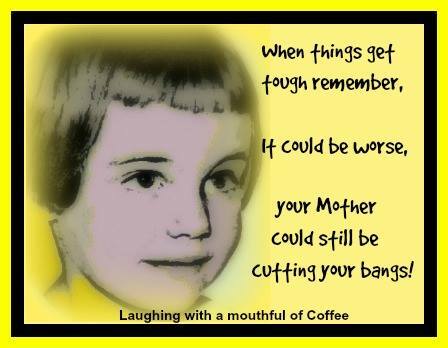 This blog is brought to you by author Sue Batton Leonard. When you were a child, do you remember sitting at the Thanksgiving table being asked what you were thankful for? It was so awkward. I hoped and prayed that all things that anyone could possibly be grateful for would be mentioned before it was my turn to speak up. There was always the person at the table that had some profound thought or reflection to share but not in my family. Thankfully, I am happy that we were allowed to be silly and if the only thing we could think of was to say we were grateful for our animals, that was good enough. No stiff collars in our clan. So, on this day before Thanksgiving, here is my thought for tomorrow. I am immensely happy to spread the joy of this notion with you, if you can relate to it! As we age, we begin to recognize the upside to the downside of life. It was the impetus behind my writing of an award-winning anthology of stories called Gift of a Lifetime: Finding Fulfilling Things in the Unexpected. With age, comes wisdom. See you back here tomorrow on Turkey Day, I will be sharing more memories of Thanksgivings of my childhood. This blog is brought to you by Sue Batton Leonard. Last Thursday evening I had an unexpected request from Lift Up, an inter-faith thrift store and food bank where I volunteer twice weekly. 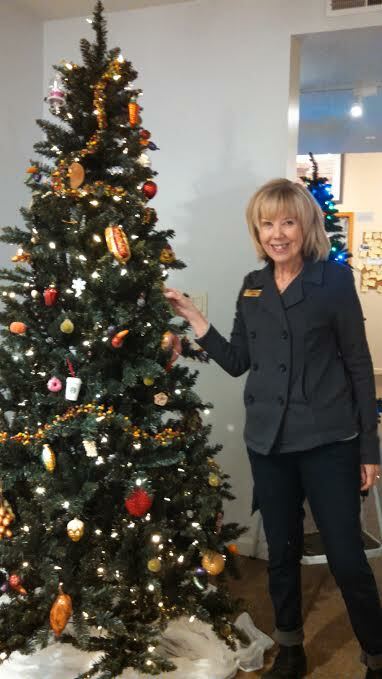 I was asked if I would help decorate for the annual “Festival of Trees” at the Tred of Pioneers Museum in Steamboat Springs, CO. I and three other volunteers, who I rarely come in contact with each other, because of our differing schedules and duties, had a great time together! 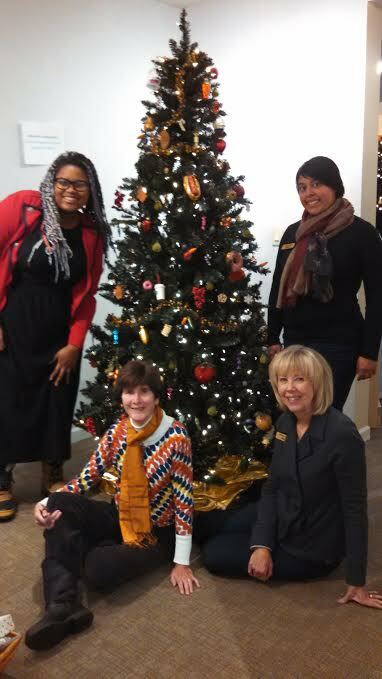 Our tree was sponsored by the Community Food Bank at Lift Up. 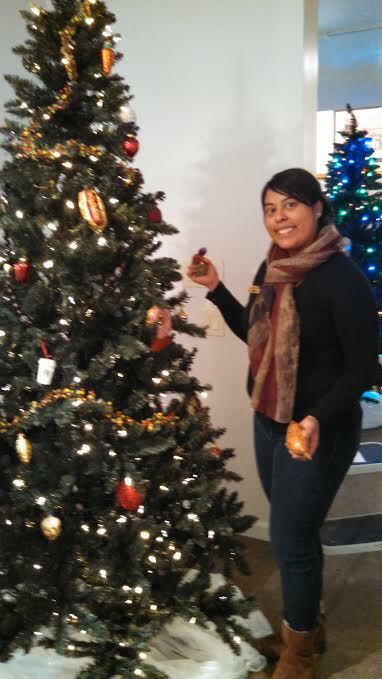 Ninety or ninety-five percent of the “food-themed” decorations that went on the tree were donated to the thrift store or came from recycled materials. 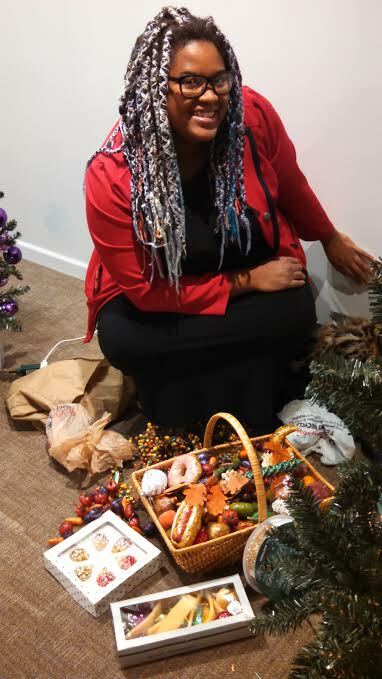 Georgi, a very creative and energetic person had used her skills to make some of the ornamental food from plastic bags and “Mod Podge,” a crafting material. She also made the tree topper – a red chef’s hat. The tree turned out beautiful. Here are a few pictures. Below: Georgi is here in Steamboat for a one year stint with the Colorado Episcopal Service Corps. She would make a great full-time resident of this community. She has yet to experience a “three wire winter” since she just arrived in town a few months ago from Pennsylvania. (That’s what locals call winters when snow so deep it reaches the third wire on fences (in other words, it exceeds your armpits!). And it happens frequently. wonderful non-profit organization that it is. 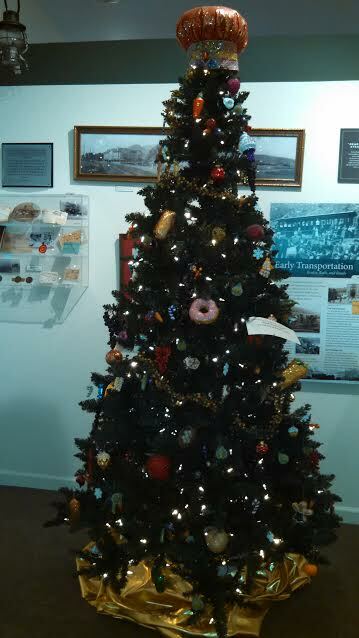 As Christmas grows nearer, I will share more pictures of the beautiful Festival of Trees from the Tred of Pioneers Museum on All Things Fulfilling. They were all delightfully decorated. I was fully thrust into the festive spirit and it continued the next day as I helped the United Methodist Women prepare for the Fall Harvest Fair. We wrapped and priced all the baked goods, jellies, jams. Come back tomorrow to see what that shopping experience looks like. Hundreds of people come through the open doors at the United Methodist Church every year to shop for the holidays and fill their empty stomachs at lunchtime with homemade soup and bread. This blog is brought to you by EVVY award-winning author of Gift of a Lifetime: Finding Fulfilling Things in the Unexpected, Sue Batton Leonard.